My daughter is almost three, but she has always struggled with sleeping through the night. The first time she tried Tired Teddies, she slept all night and in her own bed. My husband and I were amazed. We have been giving her one at bedtime every night. It has made a significant difference in our household. She has stopped taking 5pm naps and staying up until 11pm, she is less grumpy, and she even finally decided to let me potty train her. All of these things have made our home a more peaceful environment. I am so grateful for Tired Teddies. We have had the pleasure of trying our tired teddies 3 times already with our 3 different children. It absolutely works!! Thank you so much for making this amazing product!! We truly love them!! Just had one of the most peaceful evenings in a while. Gave them the teddies, read and said prayers, and whereas they’re usually bumping around and chattering for an hour they were OUT LIKE THE LIGHTS and woke up happy! Thank you so much! The first thing my 8 yr. old said when he put it in his mouth was ‘yum’ no joke. And he was out in 20 min. It was a success! In LOVE with Tired Teddies! I am in LOVE with tired teddies! My 3 yr old has sleep issues and these have helped so much! She normally wakes after just a few hours of sleep at night and is wide awake. Give her a tired teddy and instead of being up until 2am she goes back to bed after just an hour of being awake. It is wonderful! I love these things! My kids actually sleep now! I hadn’t planned to use this so soon, but I am sick and my kids were wild tonight! We gave my kids (6 & 3) tired teddies and within 30-40 minutes, they were zonked out! My 6-year-old can stay awake for hours reading and my 3-year-old struggles staying in bed. I am so impressed! Love the product! This product is amazing. I used while making a long drive and also while camping. Normally my 2 1/2 year old wakes up when we travel, not this time. Within an hour of taking these he was out and not another peep was made. These also saved my life while camping, he slept the whole night in a tent!!! My Whole Family Is Sleeping Better! I have to say I was extremely skeptical about Tired Teddies…but after a few weeks of use, my whole family is sleeping better! Bedtimes have gone from 11pm or later to 9pm, it’s AMAZING! 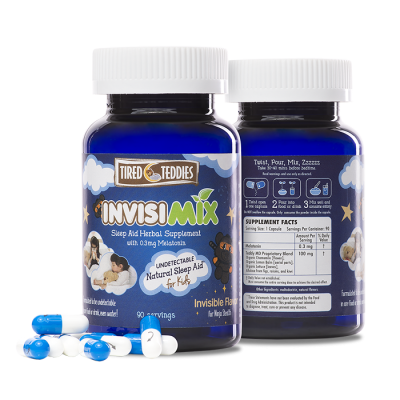 We purchased them primarily for my two year old who was on a crazy sleep schedule, and they work wonders. But then my daughters started taking them and they’re both sleeping well and waking up rested. I find that amazing considering my oldest daughter is suffering from nightmares that have kept her from sleeping well for over a year now. Thank you Tired Teddies. My family is now sleeping well! My little girl loves tired teddies and they have been a miracle for her! She used to have a hard time falling asleep, especially when we travel, and now putting her to sleep is so easy. It doesn’t make her feel groggy in the morning and she still naps wonderfully without one the next day (she hasn’t had any negative side effects). Thanks so much! It works very well even for adults. Thank you!! Could not be happier with Tired Teddies! I have 2 young boys, both diagnosed with an Autism Spectrum Disorder. They are very happy and active little guys! Sleep does not come easily for them. This has helped us SO MUCH! Thank you for sleep!!! I will continue to reorder!! My kids loved the flavor of these tired teddies and loved the cute teddy bear shape. And best of all they went right to sleep! I left all three kids with a babysitter the other night and I thought it might help to have them take one while I was gone. The babysitter texted me and said all three kids were asleep by 7:45pm! Whohoo! This is an awesome product that works! I bought this product for my 2 year old daughter who was having trouble falling asleep and started throwing tantrums at bedtime. They work amazing. I give her one 30 minutes before bed and she goes right to sleep. I swear by them now! I get quiet evenings and no fuss from the kids. Their dad who has chronic sleep issues after years of shift work is able to sleep! He is also sleeping deeper, and that gives him a chance to do better work when he is there. Thank you, Teddy MD! Our family is forever grateful. Tired Teddies is great for children with chronic sleeping problems or kids in difficult sleeping environments. Unlike other sleep aids, it is formulated just for kids with correct dosage amounts. That means it’s safer and works better. As a medical professional and a father, I recommend Tired Teddies. My two year old would stay up playing for over 2 hours at night after being put to bed, now he asks for his “bear treat” and is out in 30 to 45 min. We also travel at least once a month and these have proven to be life savers on the plane. He takes one as we board and is asleep by take off. He has not experienced any side effects and has a happier attitude about night time. As a doctor, I recommend Tired Teddies to anyone traveling with small children, or with children struggling to sleep at night. It is safe for daily use.